Jacksonville University is host to a wide array of talented individuals, from students to faculty, biology majors to coaches, marine scientists to international students, each leaving their own indelible mark on JU. In the spirit of new beginnings, as summer rolls around, it seems worthwhile to look back and reflect on the accomplishments of some of JU’s finest. The individuals profiled throughout this series have demonstrated excellence that goes above and beyond the expectations of the classroom, leaning into new and exciting opportunities sure to leave a lasting impression. They prove that, even in the heat of Florida’s summer sun, JU still outshines the rest. Janel Palomo, a Jacksonville native, comes from a family steeped in the medical community, which influenced her decision to go pursue a career in medical research. Her parents migrated from the Philippines as doctors, becoming registered nurses upon entering the United States. Coming to Jacksonville University, Palomo, now a biology major and rising senior, found herself involved in research under the tutelage of Professor of Biology Anthony Ouellette. Palomo says, “He taught me how to understand microbiology, and to better train me, he paired me with graduate student, Shelby O’Brien.” Although O’Brien has since graduated, Palomo has carried on her work, studying Vibrio vulnificus, though Palomo’s focus is on a pathogenic strain of the bacteria. 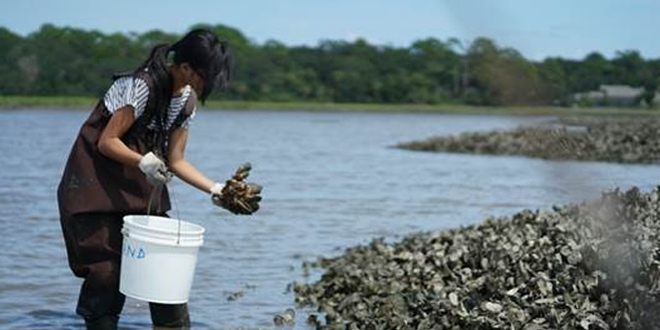 Palomo has since presented her research at the Timucuan Preserve here in Jacksonville, the Florida Collegiate Honors Council Conference in Fort Myers, Florida, the Association of Southeastern Biologists in Myrtle Beach, South Carolina, and the National Conferences in Undergraduate Research in Edmond, Oklahoma. Check out the rest of the profiles in this series.